Did you ever catch snowflakes on your tongue? You may reconsider after reading this post on Yahoo! 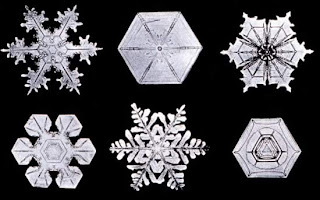 News about how snowflakes are formed: AP Science Writer Randolph E. Schmid's article notes that "scientists have long known that, under most conditions, the moisture needs something to cling to in order to condense" into raindrops or snowflakes -- but, according to Brent C. Christner, an assistant professor of biological sciences at Louisiana State University, "Bacteria are by far the most active ice nuclei in nature." Christner and colleagues are publishing a study of these findings Friday in the journal Science. Schmid reports, "In some samples as much as 85 percent of the nuclei were bacteria." Bacteria were most common in France, but bacteria was "present to a lesser degree in Antarctica." A particular type of bacteria, Pseudomonas syringae, was most commonly found in the samples. Pseudomonas syringae can cause disease in several types of plants including tomatoes and beans. The article speculates that it may be helpful to combat drought by planting crops that attract these bacteria -- but agriculture is far from most Chicagoans' thoughts this evening. No, tonight the focus is on tonight's forecast for the 35th measurable snow of this seemingly interminable Winter. Tom Skilling's article on the Chicago Tribune website advises that, whether we get any more snow tonight or not, we have had "well beyond the 30 measurable snows that have occurred in the average complete season here since 1928." It's not just your perception. It has been a long Winter. And now we find there's bacteria everywhere. Cartoonist Carl Skanberg dares to dream the impossible dream. Let's hope his dream becomes a nightmare for Cleveland and Detroit. Ross Eagle, husband and law partner of Diane L. Kenworthy, who recently won the nomination of the Democratic Party to the Morrissey vacancy in the 10th Subcircuit, wrote me a note analyzing the role newspaper endorsements played in determining the outcome of the recent primaries. "I never seem to see any after-action report from the newspapers about how often their endorsed candidate prevailed," Eagle wrote -- and then supplied one. Eagle may have been inspired by the fact that his wife was snubbed by both the Tribune and the Sun-Times (both papers endorsed John Mulroe). Whatever his inspiration, Eagle's analysis was quite interesting. First, Eagle noted, the daily papers' endorsements were a very good predictor of outcomes in the countywide races. Depending on how the Ryan/Lingo contest for the Murphy vacancy comes out (the last coverage I saw was a Law Bulletin article from February 12 which suggested that provisional votes were still being counted and both sides were gearing up for a possible discovery recount -- with Ryan holding a nearly 1,500 vote advantage) the Tribune may have called the winners in every single one of the nine countywide races. Again, depending on the outcome of the Ryan/Lingo race, the Sun-Times will finish either 7-2 or 6-3. Eagle wrote that the newspaper endorsements "might be overrated when it comes to subcircuit races." Certainly the Tribune's endorsed candidates in these races did not fare nearly as well. Eight of 18 candidates endorsed by the Tribune in the subcircuits were defeated -- with another, Stephen Stern, behind by about 100 votes to Dominique C. Ross in the too-close-to-call race for the A vacancy in the 5th Subcircuit. Candidates endorsed by the Sun-Times fared even worse: The Sun-Times made endorsements in 19 subcircuit races (the Trib chose not to pick a Republican in the 12th Subcircuit race), but at least 10 of these candidates were defeated -- and possibly 11, depending on how Stern fares in a likely recount. Stern, like Lingo, was endorsed by both papers. According to Eagle's count at least six other subcircuit candidates were endorsed by both papers... and still lost. Of course, the newspapers chose not to explain their choices, particularly in the subcircuits. The Tribune provided only the job titles of the subcircuit candidates it endorsed ("Judge", "Assistant State's Attorney", the ever-illuminating "Attorney", etc.). 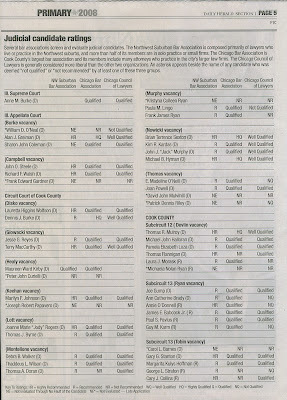 The Sun-Times didn't even provide that much; except in six races (one countywide, one subcircuit) the Sun-Times provided only the names of the candidates it favored. On the other hand, even in the subcircuit races where the Sun-Times offered some insight into its selections, the paper still went only 2-3. Two of those three 'losses' came in the 10th Subcircuit. Eagle observed that, while the Sun-Times endorsed none of the three winners in the 10th Subcircuit races, the Democratic Party was only 1-2 (Kenworthy being the lone slated candidate to prevail) and the Tribune was only 1-2 as well (it endorsed Ursula Walowski for the Kowalski vacancy). Further analysis is surely in order. In the course of my primary project, I had the opportunity to correspond with Albert J. Klumpp, PhD, a Research Analyst with the Chicago firm of McDermott Will & Emery LLP. Dr. Klumpp's 2005 Ph.D. dissertation at the University of Illinois (Chicago) was entitled, "Judicial Retention Elections in Cook County: Exercise of Democracy, or Exercise in Futility." 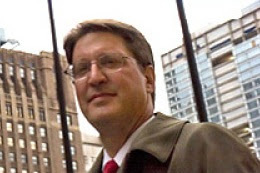 He has since published in Chicago legal publications on retention elections including, "Voter Information and Judicial Retention Elections in Illinois," 94 Ill. B.J. 538 (October 2006) (membership required), and "Cook County Judicial Elections: Partisanship, Campaign Spending, & Voter Information," CBA Record, January 2007 (p. 34). While he continues to study judicial retention elections, Klumpp has developed "a model for analyzing primary elections" that he's only just begun to test. Klumpp wrote that his tentative model "indicates that female candidates had a gender advantage of nearly 200,000 votes. That's for one female candidate running against one or more male candidates; multiple female candidates in a contest split the advantage. That compares to shifts of around 60,000 for slating, 120,000 for a sweep of superior recommendations from the Tribune, Sun-Times, CBA and CCL, and 130,000 for an Irish-name advantage. I don't have final figures on campaign spending so these numbers could change somewhat -- campaign spending may have had an effect in a few contests -- and with only a dozen races it's not exactly a large data set, but the model appears to work very well so I think those numbers will pretty much hold up." If I understand this correctly, this model would predict that a woman two years out of law school, but possessed of an obviously Irish name, would pretty much always beat a man with a non-Irish name even if the man were (a) slated by the Democratic Party, (b) endorsed by both Chicago daily papers, and (c) rated qualified by both the CBA and CCL. If this tentative model is even close to accurate, the need for redoubled efforts at voter education in judicial primary elections is clearly demonstrated. And just one other thing -- only a 60,000 vote boost for being slated? 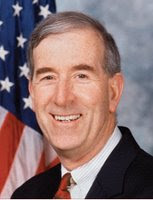 James E. Babock, Jr. has posted a "final letter" on his website, expressing his thanks to friends and supporters in his recent unsuccessful bid for the Republican nomination for the Ryan vacancy in the 13th Subcircuit, offering some observations about events during the campaign and venturing some suggestions for improvement of the election process in the future. Judicial candidate ratings in question. Andrew Schroedter, Daily Herald Staff Writer. Republican judicial candidate Martin C. Kelley received a “recommended” rating from the Chicago Bar Association. Jill C. Marisie and Cary J. Collins, Kelley’s fellow candidates in the GOP primary for the Cook County Circuit Court 13th judicial subcircuit were “not recommended.” Kelly, however, is a former investigator for the Chicago Bar Association’s judicial evaluation committee, the same panel that rates judicial candidates. He resigned from the committee when he decided to run for the seat…. Regular readers of this blog will have seen comments on some prior posts suggesting that this rating or that was personally or politically motivated. There are going to be instances where reasonable people can disagree on ratings -- there are numerous instances just in this past campaign where bar associations, reviewing the same materials on the same candidate, arrived at different opinions. However, I submit that the people of Cook County owe a debt of gratitude to these anonymous evaluators. Lawyers looking for opportunities for pro bono service would be well advised to volunteer to help out on the judicial evaluation committee of the bar association of their choice -- even if, and maybe particularly if, that service inspires the lawyer to someday run judicial office for himself or herself. Babcock makes the point that, in choosing to list the recommendations of only three of the bar associations, and even in the brief description of the three bar associations contained in the table, the Daily Herald was indeed editorializing -- even if it didn't make its own formal endorsements. If you see any other election post-mortems, leave a comment or send an email to this blog. Anita Alvarez won the Democratic nomination for Cook County State's Attorney and female candidates won most of the contested judicial primaries -- but not all of them. In the marquee match-up at the top of the ballot, Favorite Son Barack Obama won 72.80% of the City vote -- while the once-presumptive nominee, Hillary Clinton, could grab only 25.29%. Senator Clinton did better in suburban Cook County -- but she still received only 34.82% of the vote, to Obama's 63.23%. On the other hand, as Abdon M. Pallasch pointed out in a February 11, 2008 article in the Chicago Sun-Times, Clinton carried a number of wards on the City's Northwest and Southwest Sides -- in wards whose committeemen claimed to support Obama over Clinton and 38th Ward Alderman Tom Allen over Alvarez. It's tempting to generalize from the Alvarez victory, the concentrated pockets of support for Hillary Clinton, and the success of so many female judicial candidates that 2008 was yet another "Year of the Woman." But it wasn't really the same voters who chose between Senators Obama and Clinton, selected Anita Alvarez, or voted for the judges: There's a drop-off as voters go down the ballot. Just over a million people voted for President in the recent Democratic Primary in Cook County (1,072,357 if you're being precise), but only about 88% of them voted for State's Attorney -- 944,269 in all, or 128,088 fewer. The dropoff percentages weren't exact, but they were pretty close whether one looks at City-only or suburb-only numbers. For example, in the suburbs, 89.3% of presidential voters also voted for State's Attorney, 75.7% for the Disko vacancy, and 73.1% for the Thomas vacancy. In the City, 87% of the presidential voters made a choice in the race for State's attorney, 75.5% in the race for the Disko vacancy, and 70.5% in the race for the Thomas vacancy. Oddly, it does not seem to make much difference whether the ward is solid performer for the regular Democratic Party or whether it strikes an independent pose. Thus, in the 8th Ward, where 21,065 people voted for President (almost all of them -- more than 95% -- voting for Barack Obama), only 91% of them stayed around to vote for State's Attorney (this was Ald. Brookins' best wards, second only to his own 21st Ward). The dropoff was not as precipitous as it was countywide, but even so, by the time 8th Ward voters reached the Disko vacancy, only 80% remained. Only 76% of the voters who voted for President voted in the Thomas vacancy; only 75.7% of the presidential voters made a choice in the 1st Subcircuit Turkington vacancy. Ralph Capparelli, the long-time Committeeman of the 41st Ward, lost his bid to hold his post (losing to Mary O'Connor), so it should hardly be considered an organization stronghold -- but the dropoff figures in the 41st Ward were in line with (and even a little less than) the countywide averages: 93.6% of presidential voters made a choice in the race for State's Attorney, 76.1% in the Disko vacancy, 72.6% for the Thomas vacancy, and between 65.9% and 61.9% in the three 10th Subcircuit races -- the high figure coming also in the race for the Morrissey vacancy, where 41st Ward resident John Mulroe received very strong support. Lakefront wards also conformed to this pattern. Tom Tunney's 44th Ward underperformed the averages: Only 76.6% of presidential voters made selections in the State's Attorney's race, only 64% in the Disko vacancy, and only 57.9% in the Thomas vacancy. More people actually voted in the 8th Subcircuit race in the 44th Ward than in some of the county races: 8,878 people, or only 62.7% of the presidential voters. Carol Ronen's 48th Ward underperformed a little less: 83.5% of presidential voters expressed their choice in the State's Attorney's race, 69.8% in the Disko vacany, and 63% in the Thomas vacancy. Most of the 48th Ward is in the 8th Subcircuit -- but not all -- which is why only 56% of 48th Ward presidential voters made choices in the 8th Subcircuit race. Here's the unhappy bottom line for candidates making direct mail buys of primary voting lists: The mailing piece will be wasted on at least one of four recipients, and maybe three of every 10. When time permits, I hope to go back to prior elections to see how this year's dropoffs compare with those in prior years. Coming sooner: Conclusions that others have drawn from this year's numbers. New on page two: A letter from the FBI? The FBI Director, Robert Mueller, allegedly writes a letter supporting a Nigerian bank scheme: Something new in spam? The Clinton-Obama cage match will be the lead story, of course, but voters in Ohio's March 4 Primary will also have the opportunity to vote for a number of judges. In Cleveland, as here in Cook County, a number of bar associations have collaborated on the evaluation of candidates for the Cuyahoga County bench. The Cleveland Plain Dealer ran a story about the bar evaluations in its February 12 editions. Members of the judicial evaluation committees of our local bar associations may be interested in comparing their recent work to the Cleveland evaluations (found at Judge4Yourself.com). If you check out the link, you'll note that the five cooperating bar associations use standard terms to describe their evaluations (Excellent, Good, Adequate, or Not Recommended) and corresponding point values (4, 3, 2 or 0). The opinion of any one bar association counts no more than any other: "Each organization's rating has been given equal weight in the averages and is not weighted by the number of members that the organization has." Candidates wind up with numerical evaluations: Some have 4.0's -- some have 0.0's -- and many fall somewhere in between. I think this gives voters an impression of scientific precision -- which is probably not warranted. I submit that a person's "impartiality, integrity, temperament, diligence and professional competence" -- the factors that the Cuyahoga County lawyers are attempting to evaluate -- can not be easily or exactly reduced to simple integers. On the other hand, the site links to biographical information on each candidate -- and has columns so voters can see who the newspapers endorsed. An AP article that appeared in the January 26 issue of the Chicago Sun-Times described a suit filed in Spain by the driver of a luxury car. Tomas Delgado's Audi A8 was damaged in a collision with a bicycle ridden by 17-year old Enaitz Iriondo. Delgado was cruising along at 100 mph at the time. The car was dented. Iriondo was killed. But -- apparently because the bicyclist wasn't wearing a helmet or reflective clothing at the time he was run over by Sr. Delgado's Audi -- Delgado sued the dead bicyclist's parents. According to the article, Delgado told the Spanish newspaper El Pais, "It's the only way I have to claim my money back." The accident happened in August 2004. Delgado's suit was filed in late 2006. But, apparently, almost as soon as this story hit the wires, the suit was dropped. This January 30 AP story cited a Spanish National Radio report that advised, "Delgado's lawyer announced that his client decided to ditch the case because of media pressure." The lawyer "spoke outside the court in the small town of Haro in northern Spain to a crowd of several hundred people," according to the AP story. The bicyclist's family was said to be "very happy" about the decision to drop the suit. With editorial tongue firmly in cheek, the Provo Daily Herald called the trial of the "Lawn Lady," Betty Perry, the "trial of the century." The trial was to have begun today. And what a trial it would have been: According to the Provo newspaper, "Nearly 100 prospective jurors were called and had to plow through a questionnaire with 115 questions." As many as 20 witnesses were expected to testify in the course of a three day trial. Friday's Deseret Morning News (from which this picture was obtained) revealed, however, that the case had settled. Perry plea bargained charges of interference with arrest and misdemeanor violation of a zoning ordinance into a single charge of disorderly conduct. The AP story says she pleaded guilty to this lesser charge and agreed to pay a $100 fine. Perry may also face six months' probation. 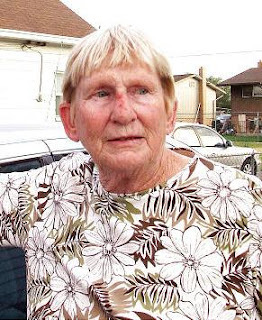 Betty Perry's legal problems began last July 6 when an Orem, Utah police officer wanted to ticket the 70-year old woman for failing to water her lawn. According to this AP story, Perry "became defiant" when the police officer asked Perry to identify herself. The Provo Daily Herald story explained, "The police version is that [Perry] wouldn't cooperate and tried to get away. [Perry] says she was merely going to call her son. Police claim she stumbled when he attempted to handcuff her; she says the officer pushed her." One way or the other, Perry sustained cuts and scrapes, and wound up in jail... because she apparently failed to obey a law that, in the words of the Provo Daily Herald, "mandates that in a desert in the summer during a fairly dry year lawns must be kept golf-course green." 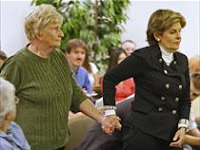 California attorney Gloria Allred (who has also made news in recent weeks for her participation in the Britney Spears custody case) represented Perry. Meanwhile, an article in the current issue of National Geographic suggests that the 20th Century was an unusually wet period in history of the American West -- Utah included -- and that the future looks much, much drier. Update 2/13/08:Ms. Perry has posted her side of this story on a website, Lawnlady.info. That's Northwestern University Law Professor Steven Lubet at left. Professor Lubet commented on this blog's recent project to provide information about Cook County Circuit Court candidates in a January 21, 2008 article in the Chicago Daily Law Bulletin. Pat Milhizer's article quoted Lubet as saying, "I doubt anybody surfs the Web looking for judicial candidates." But I think there's evidence to the contrary. Now... some 500,000 voters actually voted in the Cook County judicial primary, so even the thousand or so visitors a day on and just before February 5 aren't that many. But some people clearly were looking on the Web for information to help them make informed choices on Super Tuesday. And more would have if the newspapers had broken their vow of silence to inform voters that information about judicial candidates was available here -- and in several other places -- on the Internet. In places other than the County of Cook, primaries might be considered the opening act -- they're the playoffs, while the November elections are the Super Bowl. We know (most of) the winners now. But where did the votes come from? The Chicago Board of Elections has already posted ward by ward breakdowns -- with precinct by precinct numbers beneath! Computers are an amazing thing. If you haven't already clicked over to the City site, let's look at some selected races and see where candidates did... and didn't get support. Subcircuits are spread over a dozen or more wards; many have territory in both city and suburbs. However, there are four or five 'core' wards in each subcircuit with substantial City territory. Take the 8th Subcircuit, for example. The key wards are 48, 46, 44, 43 and 42. Ann Collins Dole, who won this race, carried roughly 33% in 42, 43, and 46. In the 48th Ward, she had 31.15% of the vote; in the 46th, she received 32.08%. 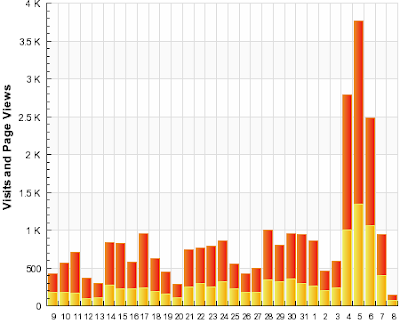 That's a fairly even distribution. Contrast this to the Morrissey vacancy in the 10th Subcircuit. Diana Kenworthy won this race; she was the slated candidate and hails from the 47th Ward, at the eastern end of this subcircuit. The key wards in the 10th Subcircuit run are 47, 39, 41 and 45. The 41st Ward is on the far Northwest corner of the City. Kenworthy's closest competitor, John G. Mulroe, comes from the 41st Ward. Unlike the relatively even distribution in the 8th Subcircuit, in the race for the Morrissey vacancy, Kenworthy polled 58.28% of the vote in the 47th Ward, but only 25.87% of the vote in 41. On the other hand, Mulroe received 58.53% of the vote in the 41st Ward -- but only 25.04% of the vote in 47. In the 45th Ward, Mulroe and Kenworthy each pulled close to 40% of the vote -- but in 39 Kenworthy received 41.10% of the vote, about 600 more votes than Mulroe received. The other two slated candidates in the 10th Subcircuit were appointed Judges James E. Snyder and Kenneth L. Fletcher. But they aren't from 47. Of these four core wards, Fletcher's and Snyder's best percentages came out of 47 -- but these were only 25.54% for Fletcher, 36.01% for Snyder. These are the 11:31 a.m. numbers. It's hard to get closer than this. That puts Ms. Ryan 1,652 votes ahead on these unofficial numbers. Maybe it's too soon to talk about it. For a number of the candidates in yesterday's primary, it almost certainly is. But let's start analyzing the results and let people join in as they see fit. Ryan holds a lead, on these figures, of 1,953 votes -- too close, presumably, to call. But the gap has grown since I started tracking this last night. Judge Michael B. Hyman -- appointed judge pulls off a victory in a four-way contest for the Nowicki vacancy that got more ink (in the Sun-Times) than all the other judicial races put together. Judge Joan Powell -- appointed judge prevails in another four-person contest. So the slated candidates won in only six of eight contests, with the ninth apparently still undecided. Is that a good result or a bad result for the Cook County Democratic Party? Related question: How many wards or township organizations deviated from the slate? In my home 41st Ward, only Judge Wolfson was mentioned on the ward organization's mailing... but, then, the long-time Committeeman, Ralph C. Capparelli, lost his bid for reelection, too (to Mary O'Connor). The 49th Ward strayed from the slate in three of the nine Circuit Court races. Can you provide other examples? Appointed judges seem to have fared well in the countywide contests... but badly in the subcircuits. What weight does a Supreme Court appointment have with voters? What did you hear yesterday about this? What are your speculations? These are City numbers as of 11:57 p.m. This one won't be over for some time. It may have been "Paczki Day" in Chicago today, not the Feast of St. Patrick, but it was still a great day to be Irish if you were running for judge. These numbers give Ryan an 1,156 vote lead over Lingo. Paula M. Lingo was the slated candidate of the Democratic Party, endorsed by the newspapers, by the FOP, by the Firefighters, by the Chicago Federation of Labor, rated qualified or recommended by the bar associations -- but she holds only a 10,000 vote lead at this juncture over Kristyna Colleen Ryan, who did not submit her credentials to any bar association. Not all the appointed judges fared badly this evening. Other appointed judges who seem to have lost their bids to hold their seats are Judge Thaddeus L. Wilson (Montelione vacancy countywide), Judge Thomas R. Mulroy (12th Subcircuit, Devlin vacancy), Judge Kenneth L. Fletcher (10th Subcircuit, Pucinski vacancy), Judge James Edward Snyder (10th Subcircuit, Kowalski vacancy), Judge Furmin D. Sessoms (5th Subcircuit, Bush vacancy), and Judge James A. Shapiro (8th Subcircuit, Sheehan vacancy). Associate Judge Jesse G. Reyes has defeated Terry MacCarthy in the Glowacki vacancy. With 87.17% of the votes counted in the City, Reyes has 254,059 votes to MacCarthy's 152,274. MacCarthy, however, won 138,000 suburban votes, holding on to an approximately 7,000 vote lead in what the first Mayor Daley called "the county towns." Maureen Ward Kirby has bested Peter John Curielli for the Healy vacancy by a 4-1 margin in the City, and nearly as large a margin in the suburbs. Marilyn F. Johnson is also running ahead of Joseph Robert Papavero for the Keehan vacancy by a 4-1 margin. Reyes, Kirby and Johnson were the candidates slated by the Democratic Party. This gives 17,837 total votes for Kenworthy, 16,750 for Mulroe. But these numbers are unofficial. These (still unofficial) numbers suggest that Judge James Edward Snyder will not retain his seat. City results as of 9:24 p.m.
One result so far, although it's just my opinion: The Chicago Election Board site isn't as pretty as the Cook County Clerk's -- but it's easier to use. This post will remain on top of this page through February 5. For new posts on this page, scroll down. Voters looking for information about the candidates in each contested Cook County Circuit Court primary may find it helpful to turn to page two of this blog and searching on a race-by-race basis. You can also visit candidate websites by scrolling down the Sidebar, by searching according to labels (that's in the Sidebar, too), or by searching for candidate name in the "search blog" box in the upper left hand corner of the screen. My thanks to Jennifer Roche of About.com for including this blog in her list of Illinois Primary 2008 Endorsements and Voter Guides. In reviewing Ms. Roche's post this morning, I found two sets of endorsements I'd not mentioned here previously. In countywide races for the Cook County Circuit Court, there are two candidates we are proud to recommend: Judges Lauretta Higgins Wolfson and Jesse Reyes. Both have served with distinction on the bench and are considered highly ethical and fair-minded. Judge Wolfson is No. 77 on the ballot and Judge Reyes is No. 81 on the ballot. There are two openly gay candidates running in subcircuit judicial races in Cook County and we urge our readers to support both. They are Judge James Snyder and Aaron Weiss. Snyder is a longtime gay community activist who was appointed to the Cook County bench in 2006. He was a leader of the effort in our community to thwart an anti-gay marriage amendment to the state constitution and has served as general counsel of the Illinois Human Rights Commission. Snyder is No. 107 on the ballot, running in the 8th Subcircuit; voters in North and Northwest side areas should look for his name on their ballots. Weiss has served as a public defender for almost 13 years, for the past six years as a lead attorney, giving him the benefit of thousands of hours of casework in Cook County courtrooms. He is recommended by both the Chicago Bar Association and the Lesbian and Gay Bar Association of Chicago. He is running in the 8th Subcircuit and is No. 113 on the ballot. Voters in the area roughly between Chinatown and Rogers Park, from the lakefront to Ashland Avenue, should look for Weiss on their ballots. Update & Correction: As the commenter below picked up, Judge Snyder is running in the 10th Subcircuit, for the Kowalski vacancy. For more about the race for the Kowalski vacancy in the 10th Subcircuit, click here; for more information on the 8th Subcircuit race, click this link. Spotted this morning on Illinoiz, this post by Gregory Tejada. It focuses on TJ Somer's filing as a Democrat in this race, even though he's previously been identified as a Republican (something mentioned here in this November 1 post), but the post is interesting because it is an evaluation of the field from the perspective of one residing in that area. It is almost time for analysis in all of these judicial races -- the last direct mail 'pieces' have been delivered, the last 'friend to friend' cards. By now the candidates know if they are or aren't on the palm cards being passed by Committeeman X. Volunteers are set to stand outside and greet voters tomorrow at as many precincts as possible. And yet -- a lot of voters are just beginning to think about who they might vote for tomorrow down at the bottom of the ballot, where the judges are. Joan Ellen Smuda is a candidate for the Pucinski vacancy in the 10th Judicial Subcircuit. I was born and raised on Chicago’s North Side. Dad was a machinist. Mom worked in a factory that made knit hats. She rose through the ranks and became forelady, a position of which she was very proud. As a young adult, I joined everything from Girl Scouts to my church’s school board. I also supervised neighborhood athletic leagues. Young people often met in my living room. I remain active in groups like the Illinois State Bar Association and the Polish American Police Association. My husband and I live in Norwood Park, a mile or so from the home where his parents raised him and where they still live. I was first in my family to attend college. I am a graduate of DePaul University and its College of Law. In 1978, I was admitted to practice law in Illinois. Since then, I have worked in state trial and federal courts throughout Northern Illinois. My legal career always has involved real life issues affecting families and small businesses. When my term as judge expired, I worked as an Administrator for the Clerk of the Circuit Court of Cook County. I also served as the first woman General Counsel of the Polish Roman Catholic Union, one of largest and most established national fraternal organizations in the United States. Currently, I am an Assistant Attorney General of Illinois. Everyday, I represent you when I recover money that others legally owe the State. Every time that I win in court, it means that you and I won’t have to pay more than our fair share of taxes to pick up someone else’s part. This year, the Chicago Council of Lawyers called me, “a ‘go to person…on legal matters” and “exceptionally knowledgeable” in my legal field. My experience in the law goes further than being an attorney and a judge. I also have been a witness in a criminal case and a juror on a murder trial. I have sat with others who testified and know how courts might confuse or intimidate anyone unfamiliar with the system. I heard first-hand how fellow jurors can view a judge, prosecutors and defense attorneys. I want to serve again as judge. I hope my well-rounded legal and practical experience can provide fair and well-reasoned justice. Every court case affects someone’s life. Both sides deserve equal regard. The process should not bog down and delay people’s lives. A judge should make sure each result is fair, prompt and clear. For more information, please see www.smudaforjudge.com. I would appreciate your vote for Circuit Court Judge, 10th Subcircuit (Pucinski Vacancy). Please vote for Joan Ellen Smuda - #116. Four lawyers who joined the bar together in late 2000 are now running for judge together, slating themselves in four separate Cook County Circuit Court races in the Democratic primary on Tuesday. The candidates formed their own political action committee named "Citizens for an Independent Judiciary," according to two of them, David John Mulvihill and Joseph Robert Papavero. The four also used that name on campaign financial disclosure reports filed with the Illinois State Board of Elections. The other two members of the group who are appearing on the Feb. 5 ballot are Peter John Curielli and Kristyna Colleen Ryan. All four were admitted to practice law in Illinois on Nov. 9, 2000. The campaigns are self-financed, Papavero said Thursday. Mulvihill, Papavero and Ryan each have campaign Web sites. Mulvihill, Papavero and Ryan graduated from Chicago-Kent College of Law together in 2000. Curielli is a graduate of DePaul University College of Law. Curielli and Papavero are name partners in Curielli & Papavero Ltd. in Glenview. The two also maintain separate law practices, Papavero said. Ryan is a sole practitioner in Chicago, while Mulvihill is a senior attorney in LaSalle Bank Corp.'s legal department. The four candidates ducked screenings before The Chicago Bar Association and the Chicago Council of Lawyers — and received negative ratings from a total of 11 bar groups. "We disagree with the bar associations' criteria for qualifications for judicial candidates," including the number of years a lawyer has practiced, Mulvihill said in a telephone interview Thursday afternoon. The CBA's long-standing benchmark for legal experience to become a judge is 12 years. Rooney's story also explains how Papavero's campaign survived a challenge because he filed as "Joseph," not as Giuseppe. As Giuseppe R. "Joe" Papavero, Joseph Robert Papavero previously ran as a Republican in the 12th Subcircuit in 2006. Each of the 'four classmates' is now running countywide. Papavero is a candidate for the Keehan vacancy. Curielli is running for the Healy vacancy. Ryan is a candidate for the Murphy vacancy, while Mulvihill is a candidate for the Thomas vacancy. David John Mulvihill is a candidate for the countywide Thomas vacancy. The most important qualities of a judge are impartiality and independent judgment. These qualities are among my strongest qualifications for Judge of the Circuit Court. As an outsider to Cook County politics, my candidacy is based on an interest in public service, and not on political connections and contributions from special interests. I believe judicial candidates should be prohibited from accepting contributions from lawyers, law firms and business associates that may potentially affect their impartiality. Sadly, these contributions have become a staple of Cook County judicial races, and are subject to little if any bar association or media scrutiny. My campaign has declined to accept contributions from these sources, and I challenge all judicial candidates running in this election to do the same. We also need to reform our ballot access process in Cook County. Under our current system, onerous and hyper-technical petition challenges are used as a political tool to drive out qualified independent candidates. Cook County voters deserve better. My professional background is unique for a judicial candidate. I currently serve as Assistant General Counsel with a major national banking association. My practice has included extensive litigation and litigation management experience, including courtroom experience defending select consumer and commercial cases. I have had the privilege of working with many top law firms throughout the city on complex litigation matters. I do not believe the judiciary should be the exclusive province of the trial bar. Attorneys from the business sector can be equally, if not more qualified to run civil courtrooms. I believe my experience in the business sector coupled with my litigation experience has adequately prepared me for service on the bench. If you agree that Cook County needs campaign finance and ballot access reform in judicial races, I respectfully ask for your vote on February 5th. 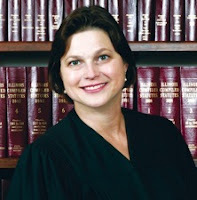 For more detailed information on my candidacy, please visit my web site at www.mulvihillforjudge.com. Vote #105.